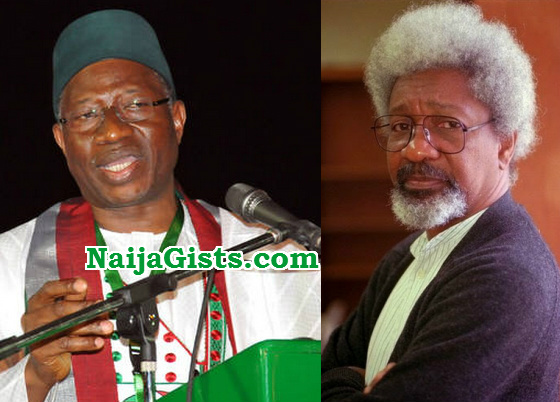 Nobel Laureate, Prof. Wole Soyinka, has said ex-President Goodluck Jonathan was really caged by some forces while in office. He said Jonathan did not know that the nation had been compromised. He also said the ex-First Lady, Dame Patience Jonathan was loose and ought to be charged for incitement or chaos. Soyinka, however, said he warned a former Chairman of the Economic and Financial Crimes Commission (EFCC), Mallam Nuhu Ribadu to beware of ex-President Olusegun Obasanjo. The Nobel Laureate made the submissions in an interview he granted a team from Zero Tolerance Magazine, produced by the Media and Publicity unit of the Economic and Financial Crimes Commission (EFCC). Soyinka said he met Jonathan on more than two occasions and it was obvious that the former President had no knowledge of what was going on. He said: “Correct. There were forces around Jonathan, which he himself did not understand and that is why I stressed that, you’ve got to choose your circle of advisers very carefully, when you are in charge. He was caged; things were going on that he did not know about. “And again, I am revealing this to you, since this won’t be published till after the elections because I won’t want to be seen as campaigning for or against one side. It shows in deep trouble governance can be, governance can dig itself into a huge hole and not even know it’s in there. The statement that was issued was issued the night when I met him. “Oh! It is more than two occasions, but two in recent times. I will tell you one interesting aspect of what we discussed. I will reveal to you that Jonathan did not know that the nation had been compromised so badly in this telephone thing with the King of Morocco. I was the one who told him when we met over an issue and I said to him, ‘by the way, how is the King of Morocco? Jonathan didn’t know what I was talking about’. “He said ‘no, I intend to speak with him, I even asked my foreign ministry to link me up with him because I am campaigning for a candidate but I haven’t spoken to the King of Morocco’. Then I said to him, ‘You better go and read the newspapers of last week’. And I can tell you, he didn’t know. Am short of words, he has many p.a what is there work? especially the one on media? anyway there is a lesson to learn for the present administrative. Prophet Gbenga, are you hear say Eucheria Anunobi was say she be prophetess? another attention seeker. cowards coming out from their shells. @Obi, your tribe is always against everything that is in the best interest Nigeria. When will your dream Biafra be a reality anyway.?? @Dehinde, I would hav askd how old u are, but I realised dat wit dis rancourous mindset u could behave dis way even @ 60. Wat would it hav cost 2 concentr8 on who u wanted 2 reply his comment? Are u now wiser dan d whole Igbos? Hello Obi, please tell me that you are joking and uninformed. You called an highly recognized professor worldwide an attention seeker. You even referred to him as coward. That comment shows that you are not a learned person and very ignorant too. I don’t know why people like get angry whenever someone talks about president Jonathan stupidity, dumbness, and low IQ? Probably you are one of those who benefited from Jonathan’s government that is known for nothing, but money laundering, corruption, insecurity, and mismanagement. Wale Soyinka has been fighting for people’s right before Nigeria gained her independent. Moreover, this great Nigerian has lectured as a tenured and seasonal professors in the top ten universities in Europe, United States, and Africa. Harvard University is one of them. You can not be serious for calling professor Wale Soyinka an attention seeker. I think is better to do your finding before making any comment about people. Weather you like it or not, majority of Nigerian people agreed to the fact that Jonathan is the worst president in our history. They voted him out because he has failed them. Shikenah! He is spare part dealer. I was use the other time to tolding you pipul say I want to go and writing exam. I am now use this time to say I have go and I have also came back again too. All my fans for naijagist wey was cry for me, wey was ask where is Bench dey, or where was Bench went to, I am a thanker to you for looking for me. I was went to be wrote my exam for the evening school wey I was a goer to. Exam didn’t easy o. They was give us matimatis say make we write am. Omo, matimatis is no be for small pikin o. I dey there de think think think think until they was colected the paper from me. I am a prayer of say make I not failing the matimatis bicos if I failing the matimatis, it go do me like say make I comit sue side bicos I was pays big money to be wenting in that schools. Abeg make prophet Gbenga helping me to beg God bifor I comit sue side and dies. Isted of make I die make sokoto goat born me fifty two years ago. Am not a fearing to do am. I am one of them I notice something in the past six days. Don’t worry success is your portion in your exam. What a shame. Thank God for this revelation about former president Jonathan clueless, dumbness, low IQ, incompetent of the highest order, his inability to put his barbaric wife in order, his poor judgements, and his poor choice of criminal and heartless advisers and political appointees who looted the nation to bankruptcy. Professor Wolf Soyinka, Emir Sanusi of Kano,and few others are highly credible, respected, and true statemen that can stand up for justice against our highly corrupt system of government for over 35 years. When these people talk, write or make comments, I listen to what they have to say. One can easily deduced why president Jonathan administration was a total failure and a great disaster to our young democracy. Criminal OBJ played his usual games of political intimidation, political manipulation, and fixing by imposing little known Bayelsa state governor on the presidential candidate Yaradua. After president Yaradua death, the same OBJ was the person who threatened the powerful Northern politicians that Nigeria will breaks if they sidelines Jonathan from becoming the president. This same Baba Iyabo was the lone force who campaign and paved way for the continuation of Nigerian economy and security by timid and incompetent Jonathan for another four years. What good come from an elected president who cannot put his own wife to order and behave like human being? What manner of a leader refuses to sack an aviation minister who illegally bought N400 millions naira bullet proof cars? What kind of President was seen dancing and campaigning the every day BH terrorists killed about 69 of his citizens and injured many in Abuja-capital city? What manner of an idiotic president hard to the suffering and hardship of the peoples by jacking up the prices of kerosene and petrol in a single day by over 75%? The list goes on and on, president Jonathan will remains for a very long time the worse political mistake in Nigerian history. Why? Criminals before him like IBB,OBJ,Abacha, AbdulSalam Abubakr were in charged of their bad policies and corruption, but this dumb Zoologist was clueless about the affairs of the state. I want to believe that President Jonathan would have performed better as a director of one of our national zoos like the Ibadan Zoo.Every criminal in Nigeria took advantage of President Jonathan foolishness. For example, some dubious and fake pastors became thickly rich and acquired private jets from him because he knows nothing. Many dubious Imans, Nollywood directors and actors, and uncountable of many other became very rich at the expense of millions of suffering Nigerian people. We should thank God Almighty from reviving our beloved nation from six years of Jonathan’s darkness, mass murder of innocent people, money laundering operation, corruption, and bad and terrible government. There is now hope for Nigeria with President Buhari in power. Omokehinde, That is the fundamental truth. Wish all these leaders and officials can be held accountable. Buhari only requires a stronger army, adequate police force and competent intelligence structures to halt boko haram and curb the excesses of niger delta militants. Then he can start probing the last 16 years with the opportunity to visit how abacha’s loot was handled and allegations against abdulsalam. Most importantly Obj must not be given immunity. And then that will be massive breakthrough for Nigeria’s healing and reform. In addition Nigeria belongs to everyone who lives inside it and they all have a right to be angry with the situation except for mischievous people who seek to disunite us by emphasing tribes. When Ibos, hausas and yorubas are united, Nigeria will become a more powerful nation. It is a natural to see an ibo neighbour as a nigerian with common cause and rather very absurd to ever see him as a biafran because he belongs to nigeria like everbody else and his place is imperishable. @DEHINDE or whatever ******** what do you know about Oni’ s tribe and Nigeria****** , Nigeria will not survive without Great Biafra within two years , Nigeria needs to let Biafran go marriage is not by force, although it must surely happen soon because Nigeria is an illegal country as the 100 years treaty signed in 1914 amalgamation has expired in 2014. Biafra must be restored ! ! @ OMOKEHINDE,I THINK *********************,WHY BECAUSE IF YOU STUDY ECONOMICS WELL IN YOUR SCHOOL DAYS YOU WILL UNDERSTAND THAT THE MOST DANGEROUS TASK TO CONTROL IS HUMAN BEING NOBODY CN BE PERFECT ENOUGH TO CONTROL HUMAN BEING,LET US FORGET STORIES,BEFORE DECEMBER,QUOTE ME,THEY WILL BEGIN TO CRITICIZE BUHARI AS WELL…. @Ayodele wise talk & @Omokehinde thank God you realise dat there are criminals in the seat of power b4 GEJ assume it. Pls let us all work 2gether & make Nigeria a great Nation.